Disclosure: This review and giveaway is sponsored by Propeller Consulting, LLC. I received a copy of the DVD to facilitate my honest review. No monetary compensation was received! Sponsor responsible for prize fulfillment! *Only one entrant per mailing address, per giveaway. If you have won the same prize on another blog, you are not eligible to win it again. Winner is subject to eligibility verification. CHRISTmas always been my favorite holiday. I loved all the church activities, the CHRISTmas plays, live Nativity Scenes, candle lighting ceremonies and more. The one thing that always stood out to me was that CHRISTmas meant love! I have always been able to sit back and FEEL all the LOVE around me. It just seems to radiate from everyone. The Nativity story has always been a favorite of my entire family and we read it every year on CHRISTmas Eve to remind everyone about the true meaning of the holiday. Have you ever wondered why we do all the other things? 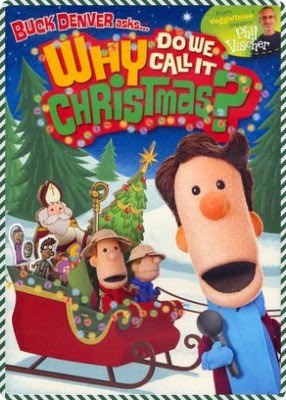 We were given a copy of the DVD, Buck Denver asks... Why Do We Call It Christmas to review. We sat down as a family and watched the DVD. As huge Veggie Tales fans, we were already familiar with Phil Vischer, so we knew this was going to be a great DVD. We loved the awesome newsman, Buck Denver. The entire journey we went on with him and his friends was fun and informative. Chefy and I were taught just as much as the kids. I never knew what Christmas trees had to do with Jesus, but I do now! NO! I am not going to tell you. You will have to watch the DVD yourself to find out! Would you like to win a copy of Buck Denver asks... Why Do We Call It Christmas? Simply enter on the rafflecopter form below! You will not be disappointed! How did ornaments because tradition?